The ocean exerts a strong pull on me, calling me with memories of waves lashing the shore or whispering over the rocks along its edge. 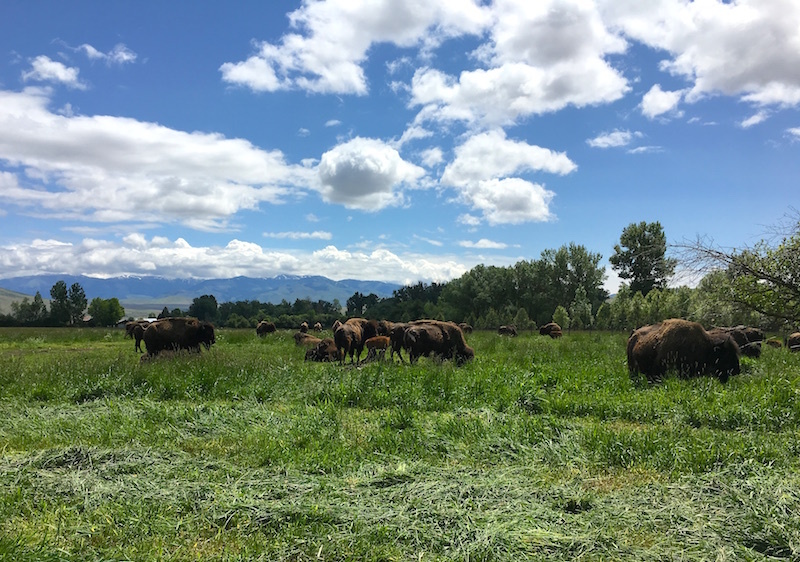 My friend, writer, author and forager Hank Shaw, recently wrote a meditation about his own relationship with the abundance of life along its edges. For as long as I have been me, I have collected the detritus of the sea. Shells of tiny whelks and oyster drills. The calcified husks of sand dollars or sea urchins. Jingle shells. Sea glass, each with an unknowable story of how it entered the ocean to be tossed about, burnished and softened over time. Mostly white, green or brown, a fleck of cobalt sea glass I found on a beach on Block Island decades ago remains one of my prized possessions, for reasons my conscious mind cannot fathom. But these were merely what I put into my pockets. The real draw of the place where ocean meets land is its living edge: the tidepool. Sometimes it is merely a depression in the beach that became a shallow lake. A lake teeming with sand fleas, minnows of indeterminate species, seaweeds and the always entertaining hermit crab. 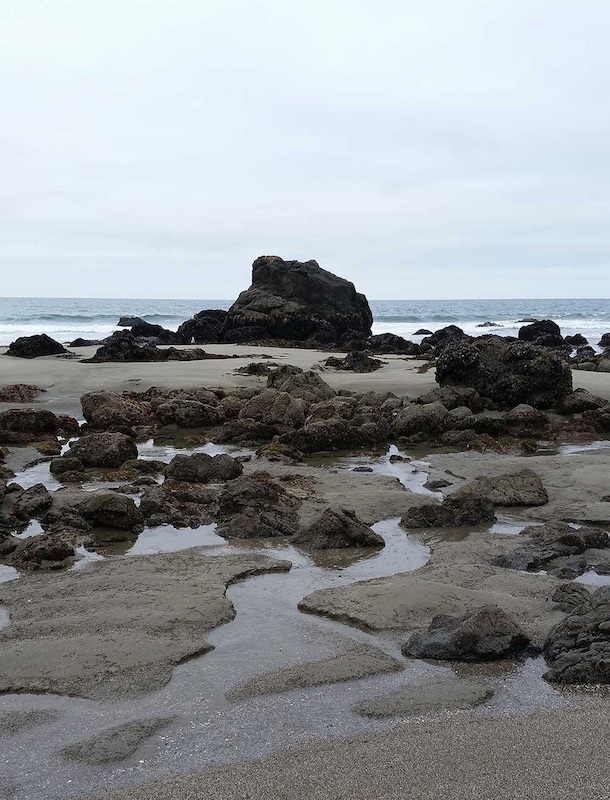 In New England and along the North Pacific, sand gives way to stone. 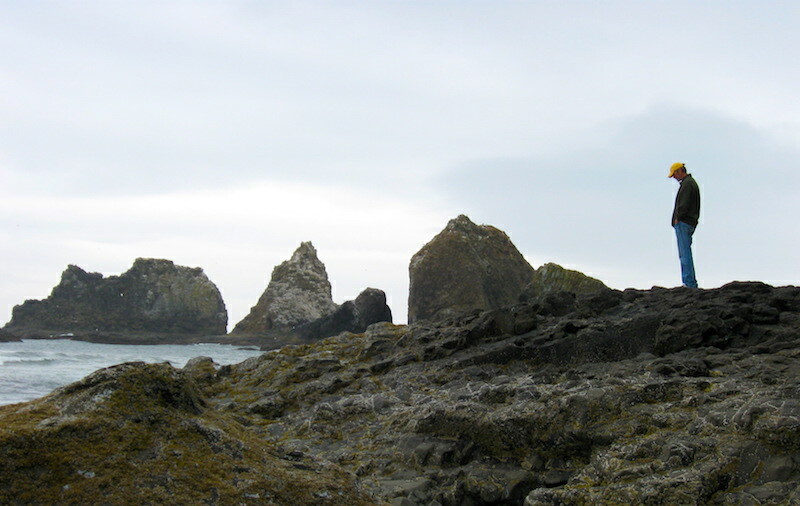 Boulders and crags litter the littoral landscape like forgotten dice tossed there by unseen giants. These stones trap pools of water, and by so doing serve as bulwarks for an array of wonder. 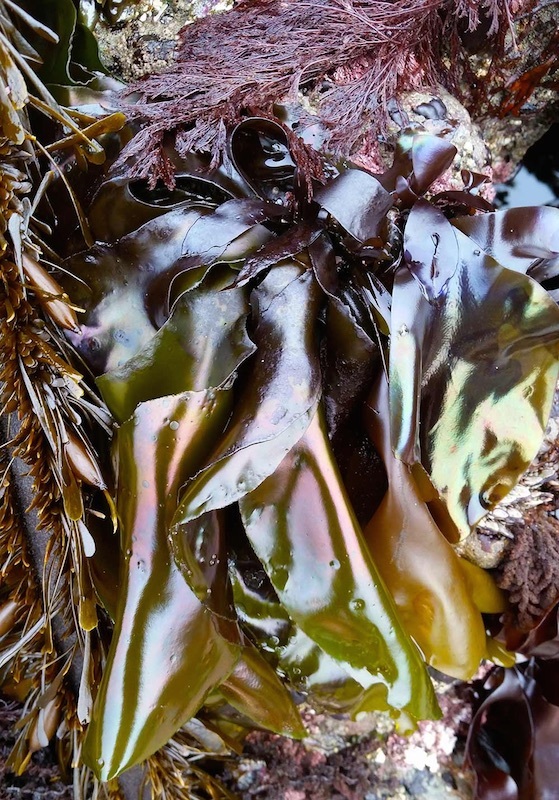 Seaweeds of endless variety. Crustaceans ranging from barely visible to alarmingly large. Lots of fish, some tempting. I once found a rubberlips perch big enough to eat, if only I could have caught him. Snails — turbans in the West, winkles in the East — dot every hard surface; to me they’re like money scattered on pavement. Mussels jostle for position on the ocean faces of the boulders, grudgingly making way for the bizarre (and delicious) gooseneck barnacles, which remind me of the 1950s saddle shoes my mom once had in her closet. I move through this kaleidoscope as I always have: As a child. 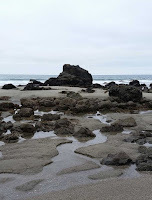 Some of my earliest memories are of tidepools. The boom and hiss of waves large enough to kill. The minerality of the air, a saline bite that mingled briny life and the reeking, iodine rot of decaying kelp or crabs. Or, once, a large hunk of whale. An inexorable descent into a coating sandiness that I knew even as a child would take all day — or a proper, indoor shower — to fully remedy. The step-sink-slip, the tightening calves and exfoliating rasp of the sand that are the price, and the gift, of walking long distances on a beach. And there is always that clammy chill hovering over the pools, even in high summer. The game is always different in the pools, but there is always action. Read the rest of this marvelous essay. 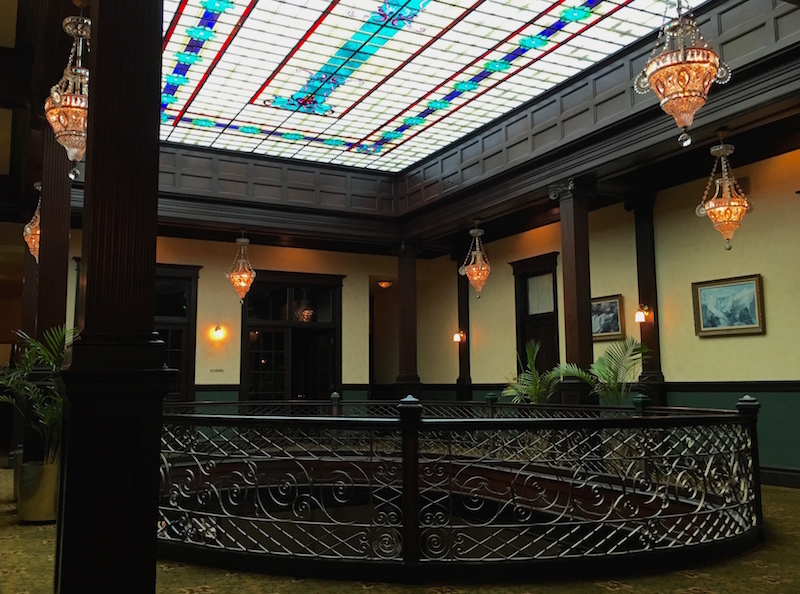 Photos at left and right by Hank Shaw. 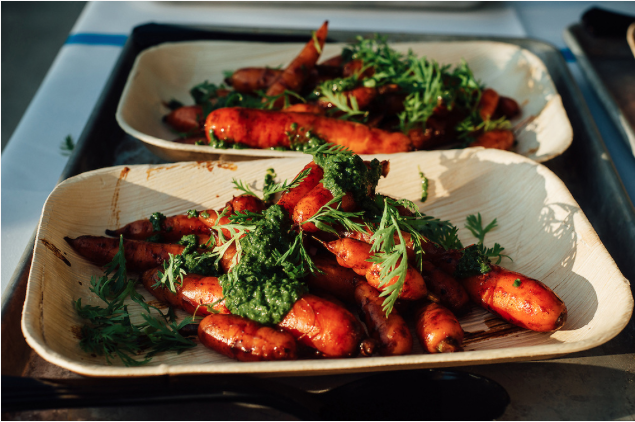 It was a big step for Ayers Creek Farm to leave the farmers' market to focus on its restaurant clients, but, not wanting to have their loyal customers doing without pantry staples, they decided to hold occasional farm days featuring the crops coming in from the fields. One of those much-clamored-for staples is the farm's frikeh, a green wheat that is harvested and "parched," a process that burns the outer husk of the grain and lends a smoky undertone when it is cooked. As contributor Anthony Boutard explains, this year frikeh has been rechristened as parched green wheat. 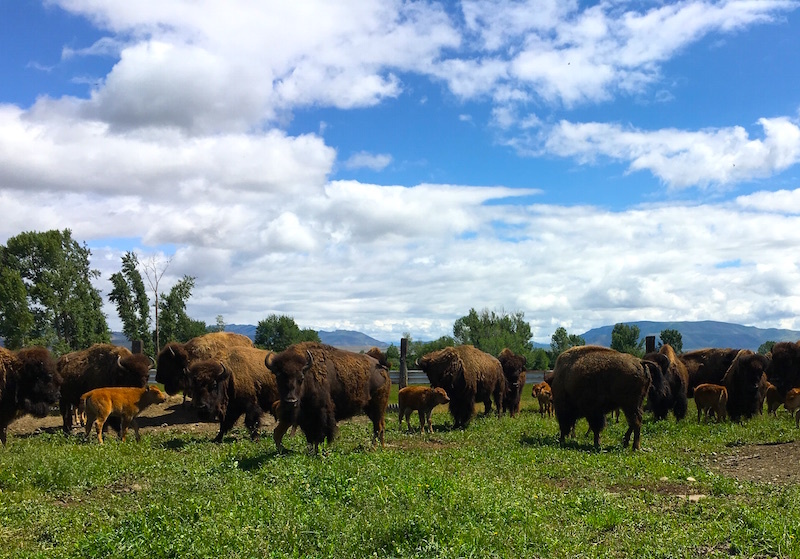 We will have an open farm day this Sunday, the 31st of July, from 1:00 to 5:00 p.m. (The subsequent farm day will be scheduled in a couple of weeks.) These open days are crop-driven and will occur from time to time into October. 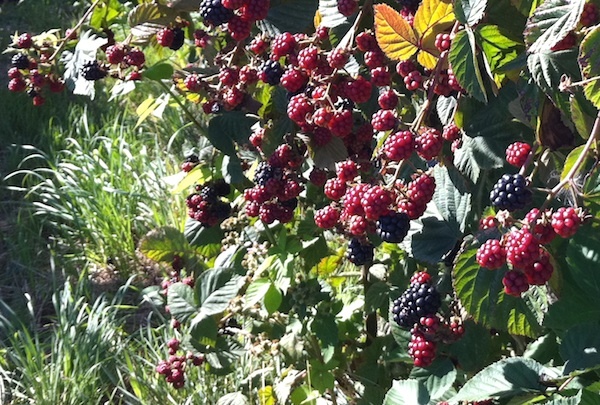 We will have Chesters and Triple Crown blackberries by pre-order only. We will need all berry orders by noon on Friday (7/29). We will be packing them into half-flats (6 pints) at $20 each. When ordering please indicate the number of half flats so as to avoid confusion. No, it won't be just berries. We will also harvest fenugreek, purslane and amaranth. Likely some green gage plums. 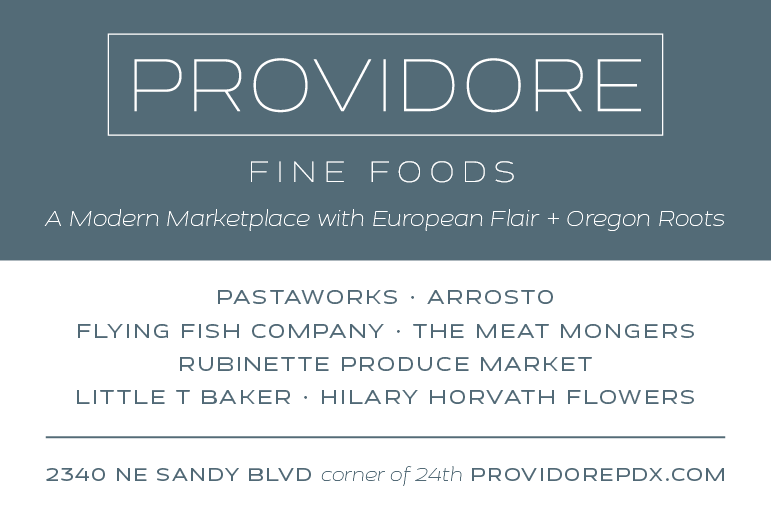 In the pantry category, we will have Wapato favas, dry beans (Dutch Bullet, Black Turtle, Black Basque), genuine Gaston mustard, parched green wheat neé frikeh, cornmeal, popcorn and preserves. Last autumn, we were approached by a staff member working with an aid organization located in Lebanon. They were helping a group of freekeh producers and wanted to subvert the increasing supply of "fake" freekeh. We had seen problem as well. 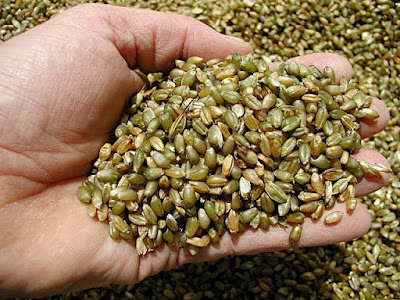 Manufacturers crush regular wheat, sometimes dying it green, and sell it as the food known as freekeh. Often it has a nasty, stuffy odor. Interestingly, around the same time the agency approached us, I had a chef describe to me some some beautiful bright green freekeh they had purchased. They were surprised it was so much greener than ours and said it must be the effect of "terroir." A bottle of green dye, more likely. The recent research into freekeh's the health benefits has generated increased interest in the food, and an industry dedicated to avoiding the true work and craft of producing it. The agency wanted us to participate in the creation of an international definition of freekeh. The United States hosts the Codex Committee on Cereals, Pulses and Legumes. The definition would be published in the international food code, Codex Alimentarius. We wrote the letter quoted below, which outlined our history with the food, and a proposal. Interestingly, as we though about the name of the food, we decided to drop the Arabic transliteration we had been using, and just describe the food in plain English: parched green wheat. That is what it is. Anthony has not received a reply to the letter, a pity because all of us would have enjoyed the visit, we are sure. 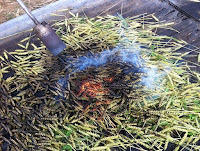 "I am finally finishing up the late autumn farming tasks, including planting wheat for next year's production of frikeh. I decided to hold off answering your inquiry because I want to detail a plan that might help bring attention to your efforts. 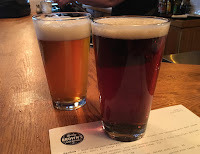 "As the post that led you to Ayers Creek explained, we have been producing high quality frikeh since 2003, and have sold tons of the parched grain just within the small metropolitan area of Portland, Oregon. I will add that frikeh production is a small part of a larger enterprise that produces hull-less barley, milling corn, chickpeas, dry beans, soy and favas, as well as fresh fruits and vegetables. We sell to restaurants within the city and a few further afield. Interestingly, none of our customers are traditional Middle Eastern restaurants, and most of the people who buy it were introduced to frikeh by us. Most have subsequently tried "Brand X" frikeh purchased in the stores, hoping to fill in the months when we run out, and found it inedible. The restaurants simply drop frikeh from their menus when our supply is gone. Our frikeh does have its own character shaped by us and our staff, and the people who buy from us. One of the advantages of knowing our customers by name. 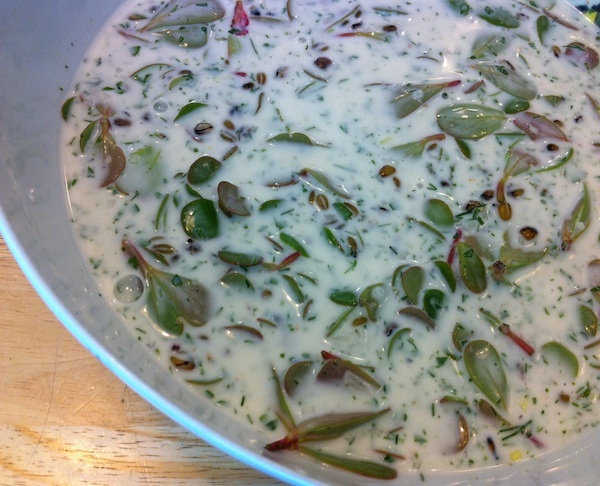 Buttermilk, purslane and frikeh soup. "The restaurants that buy our frikeh point to the breadth of its potential market. For example, we have a Japanese restaurant, Chef Naoko, that uses frikeh in its bento box salads. The restaurant provides bento boxes for the business-class lunch service on Delta's flights between Portland and Tokyo. 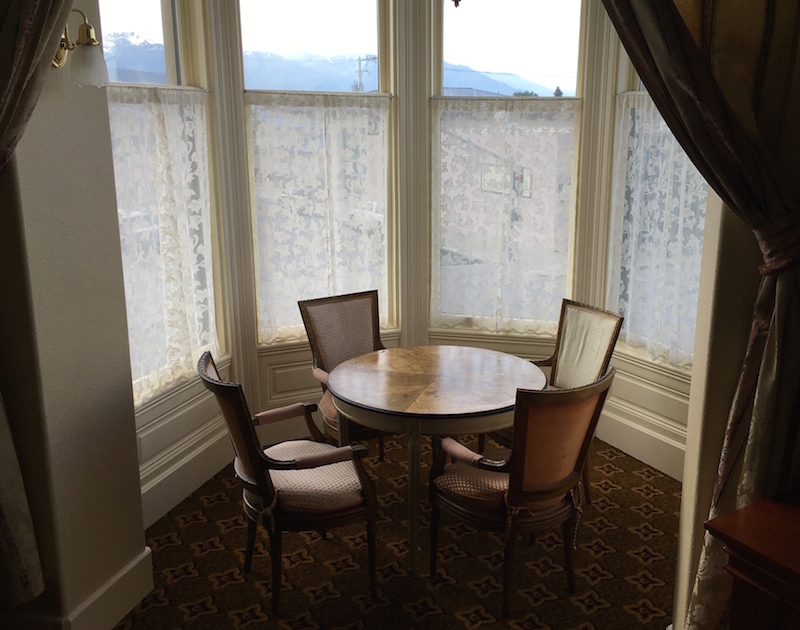 Higgin's Restaurant is our first and biggest frikeh user, and it is hews to a northern French menu. Two classic Italian restaurants, Nostrana and Ava Gene's, serve frikeh-based dishes during the summer months. 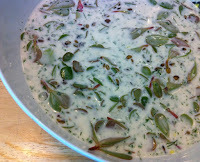 At Nostrana, frikeh is served as a pilaf and also in a very refreshing buttermilk and purslane soup. The fact that frikeh can draw these restaurants out of their standard ingredient list speaks to its appeal. It fits into any number of cuisines. "At the market, we have several customers who enjoy frikeh with yogurt for breakfast. 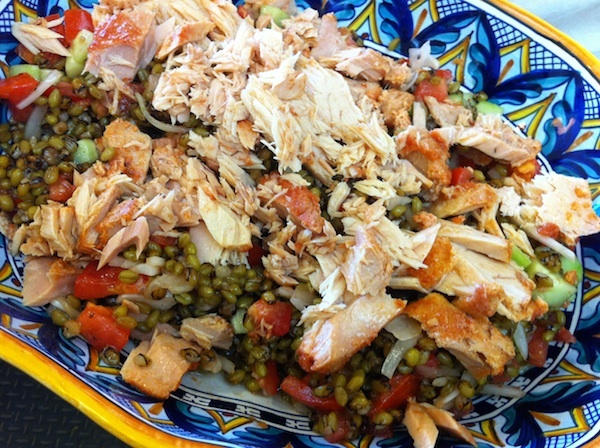 Our friend Linda Colwell serves it in a salad of home-canned Oregon albacore. 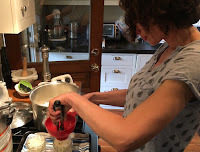 Carol and I make a lamb tartar with frikeh. The lamb is coarsely ground, mixed with the frikeh in equal parts and seasoned with mint, lemon, olive oil, shallots and parsley. Inspired by raw lamb in kibbeh, though it is very different in texture. "With this experience in mind, I invite a group of the Lebanese frikeh makers you work with to visit us in Oregon. Portland is a market well-primed by us for appreciating quality frikeh, and it would give them an opportunity to meet a new group of customers that see beyond its genesis as a Middle Eastern ingredient. The chefs would have a good time. Provvista Foods has long tried to carry our frikeh, an overture we politely decline because we prefer to sell directly to our restaurant accounts. I have seen information on your freekeh and the grain looks good, though the pitch that frikeh is cheaper than quinoa detracts from the message. It sounds unnecessarily defensive, especially as frikeh is a delicious food on its own accord. Sounds like a pitch for generic versus branded medicine rather than food—it is just as much a superfood, but cheaper. A week with fresh voices who love the ingredient would improve the message. I am sure we could get a good write-up describing frikeh makers a world apart meeting each other, likely with good national coverage. We have a strong National Public Radio affiliate (Oregon Public Broadcasting) here that might see it as an interesting story with nice blend of local and international flavor. Our friend, Deborah Madison, is a longtime devotee of frikeh and may have some insights into how we could make the meeting an entertaining and compelling story. Locally, Linda Colwell, mentioned earlier, is the farm's Melete, Muse of Occasion, and could help us put together a good visit. Most recently, we hosted 70 attendees of 'Organicology' and about 80 legume researchers from around the world from the Bean Improvement Cooperative. The visit could include a stop in the San Francisco area. Steve Sando of Rancho Gordo has a great deal of experience working with farmers from Mexico who supply him some of the beans and corn his store carries. He may have some excellent ideas about marketing frikeh in the United States. Both Ranch Gordo and Ayers Creek have done a good job of making some pretty humdrum staples like corn, barley and beans interesting. Over many years, we have sold frikeh to Boulette's Larder in San Francisco, and perhaps the delegation could try their culinary treatment of frikeh. Although I have no general qualms about amending various codices to include a definition of frikeh, I do know that people buy on the positive. Having a government agency define an ingredient will not improve sales or expand interest in the grain. Both Ranch Gordo and Ayers Creek produce and sell premium beans and grains successfully in a market where there is a flood of cheaper alternatives by focusing on quality and character. At Ayers Creek, we also shy away from all health claims. I think the overused jargon surrounding health benefit claims for all sorts of commodities creates a white noise of claims that detracts from the pitch. When people return to buy more frikeh, they describe that special smoky, sensuous and grassy quality in the grain and how they served it, not some tenuous health benefit that has given them a bit more skip in their step. Anyway, we are extending this offer, and would love to host a group of fellow frikeh/freekeh makers. If, over time, you want to amend the FGIS Codex to include a definition of frikeh/freekeh, I would be happy to write a collegial letter in support, but I am not interested in taking the lead on such an effort. Even a flood of really awful fakes would not have any effect on our sales. Indeed, the more awful, the better, because they simply amplify the quality people have come to expect from our frikeh." 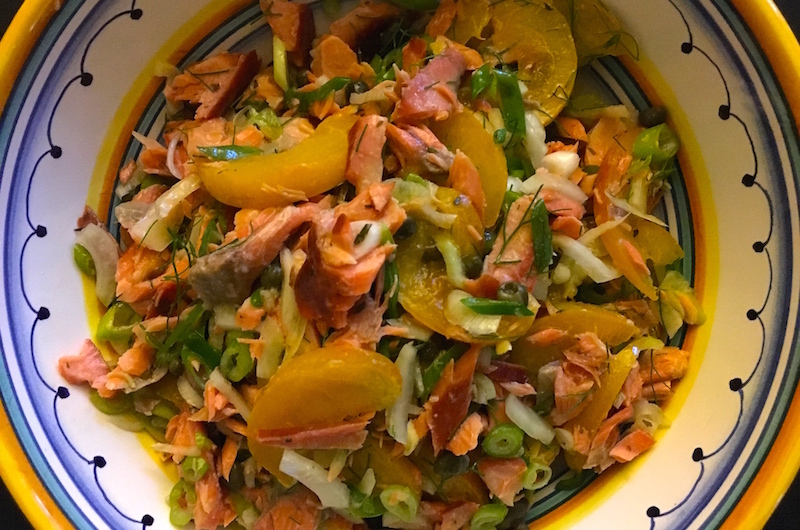 A simple salad made from the freshest summer ingredients is always a good idea on toasty summer days when you want something cool and refreshing but don't want to cook. Contributor Jim Dixon of Real Good Food goes classic-with-a-twist in this panzanella featuring fresh peaches. I came home from the weekend farmers' market with more peaches than I could eat, thanks to my friend Trevor from Baird Family Orchards. I'll be making some desserts soon, but first a savory twist using peaches instead of tomatoes in the classic Tuscan bread salad called panzanella. Like tomatoes, peaches are both sweet and acidic, and they can often be used where you might find tomatoes. 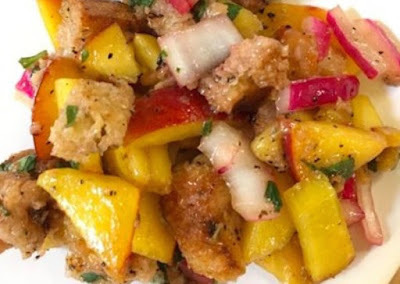 The thrifty Italians don't let anything edible go to waste, and panzanella was traditionally made with hard, stale bread soaked in water to soften, then squeezed to a soft pulp. I prefer to use fresh or slightly stale bread that's grilled or toasted, then cut into small cubes. It'll eventually soften as it absorbs the liquids in the salad. You'll need roughly one peach for each slice of bread, maybe 4 of each for a salad to feed four to six people. But first thinly slice a red onion and soak it in a couple of tablespoons of Katz red wine vinegar [regular red wine vinegar works, too]. Cut the bread in to half-inch cubes, the peaches into bite-sized pieces. Tear or slice a good handful of basil leaves into thin strips. Combine everything in a large bowl, add a generous amount (maybe four tablespoons) of extra virgin olive oil, a light pinch of salt (unlike Tuscan bread, ours will add some salt, so taste before adding) and some freshly ground black pepper. Mangia. A neighbor up the street is a poet, so naturally you'd expect him to have a poetry box on a post outside his home. And he does. I noticed the other day that he'd posted a new poem in the box, and it's perfect for the season. 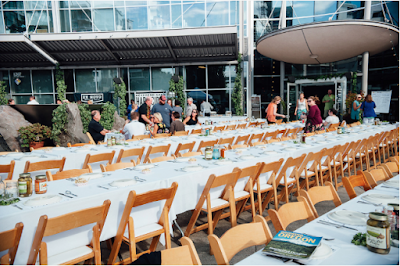 A seven-course, farm-to-table dinner for $20? I know, I couldn't believe it, either. Especially having recently attended, courtesy of very generous friends, a similar dinner costing more than ten times that amount. Which, while outrageous for most of us, isn't considered out of the ball park for one of these affairs. Since my curiosity had been piqued, I had to call and ask Jason Ball, Research Chef at the Food Innovation Center at Oregon State University (OSU)—which is coordinating the series sponsored by the Oregon Department of Agriculture and OSU—what the deal was and how it could possibly be so cheap. 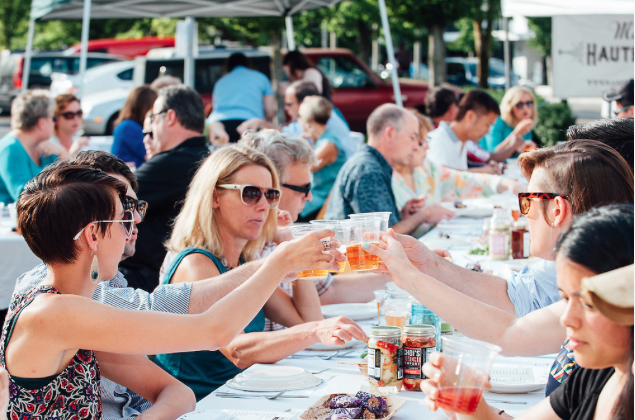 He said the idea was to have a series of pop-up dinners across the state that showcased Oregon's specialty crops and the small entrepreneurs who use specialty crops in their products. 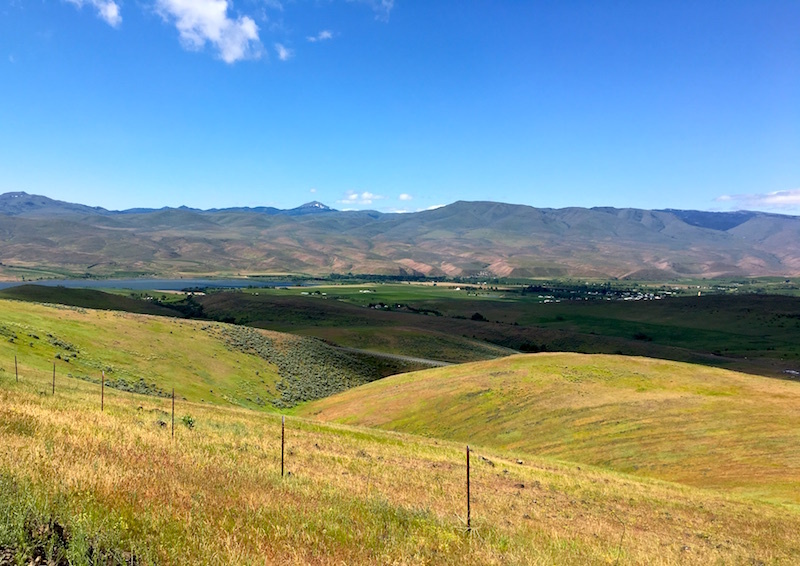 That led to writing a grant proposal to the US Department of Agriculture's Specialty Crop Block Grant Program for a two-year dinner series designed to increase awareness of Oregon's fruits, vegetables, tree nuts, dried fruits and nursery crops. 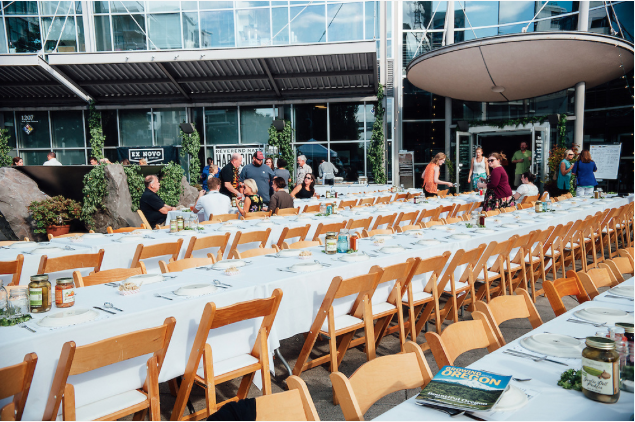 And that's where that low, low price comes in: the cost of each event is subsidized by that grant, making the events accessible to more people who might otherwise not be able to afford a couple of hundred bucks per ticket to get to know their farmers. 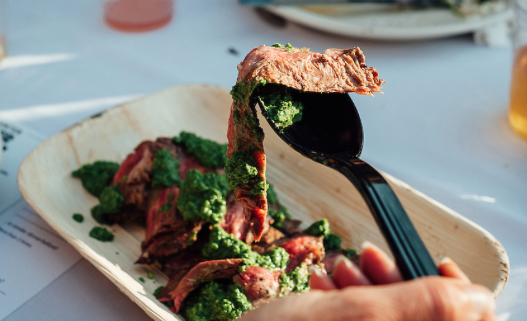 A bonus is that each dinner will not only feature a chef-prepared, several-course dinner—there's a cash bar for local beer and wine—but the event also includes a farmers' market-style "showcase" reception where ticket-holders can buy some of the crops that will be appearing on the menu. And on top of that, each attendee will be provided with five coupons for $1 off the price of purchases at the event's farmers' market. Is this sounding like the event of the summer? It sure is to me! So as not to keep you in suspense, here's a list of the events with a link to get tickets. Have fun! Farms: Big B Farms, Oregon Dulse, HBF International (formerly Hurst's Berry Farm). Information is available on the Aurora dinner, with more details to come on subsequent events. You can also sign up for notifications when next year's series is scheduled. Photos courtesy the Food Innovation Center. The other evening Dave had smoked a luscious fillet of Kenai Red that I'd been given as a sample from the Kenai Red Fish Company, which offers a subscription—instead of CSA (Community Supported Agriculture) it's called a CSF (Community Supported Fishery)—for a season's share of the salmon caught in the Cook Inlet near Homer, Alaska. There were a couple of cups of the fillet left over from dinner, so I put it away thinking I might throw it into a chowder or use it for a batch of salmon cakes in the coming week. Then, when my brother asked us over for dinner a couple of nights later I queried him about what we could contribute. He said, "How about an appetizer?" 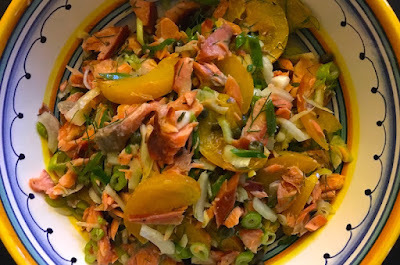 That's when I remembered the salmon I'd stowed in the fridge, and after rummaging in the vegetable bin I came up with half a fennel bulb, some green onions and two local yellow plums. Maybe a fresh, crunchy salad to put on crackers or crostini would fit the bill. 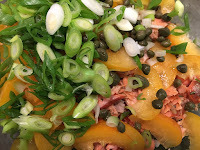 Put salmon, fennel, fennel fronds, plums, capers, green onions and pine nuts in large mixing bowl. Drizzle olive oil over the ingredients and add half of lemon juice. 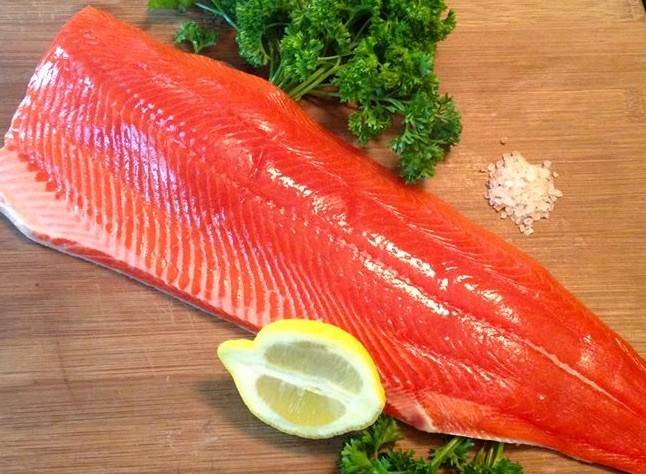 Toss gently to combine but don't break up the salmon too much. Adjust lemon juice and add salt to taste. This would be a great lunch salad or light entrée served on a bed of fresh-from-the-garden (or farmers' market) lettuce. 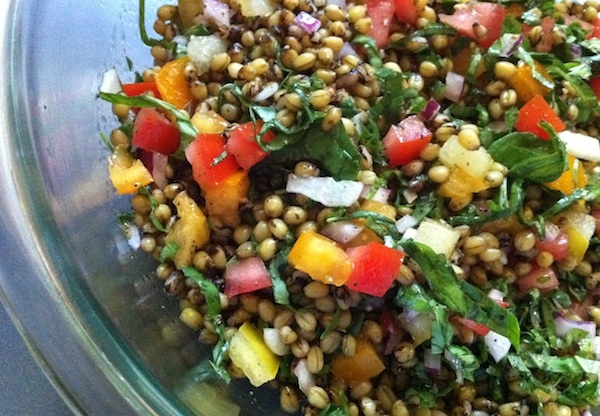 It would also be terrific combined with pasta or a cooked grain like farro, barley or parched green wheat (frikeh). This is the story of Jon Bansen, a dairy farmer in Monmouth, Oregon, who grew up on the land his family had farmed for generations. In this short film by documentary filmmakers Rebecca and Fred Gerendasy of Cooking Up a Story, Bansen explains why he decided to transition from conventional agriculture, with what he calls its "lotions and potions," to farming and raising his dairy cows using organic methods. He explains that, ironically, it's the way his grandfather farmed before the industry was taken over by big chemical companies. "That's the wonderful thing about organics," he says in the film. "It's about bringing biology back to our food instead of being about industry." 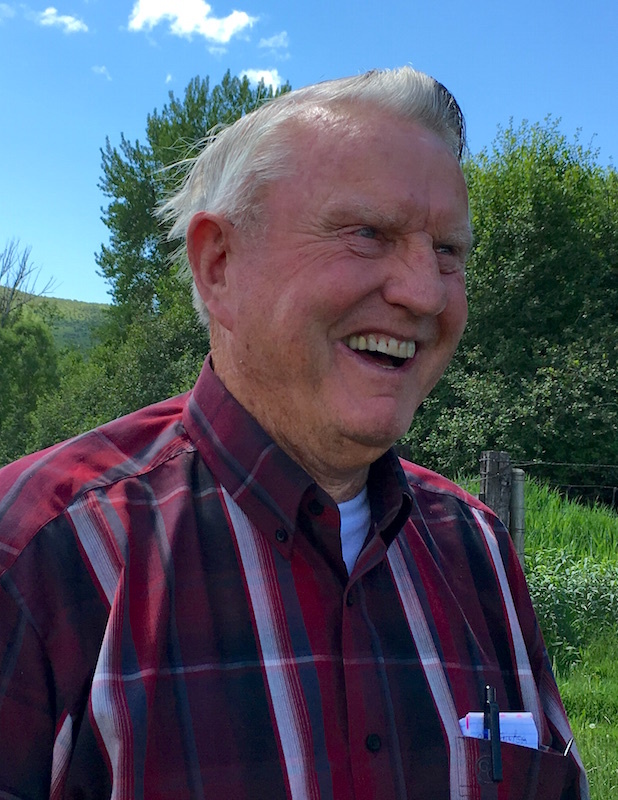 Watch part one of Bansen's story, "Organic Dairyman: A Family Tradition," and part three, "Birdhouses: Using Nature to Control a Farm Pest." I cultivate friends with skills. Like Hank Shaw, master forager and inspiring hunter and cook, who showed me how to pluck wapato tubers from the marshy muck on a wetland's verge. 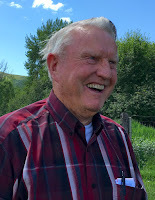 Or Jack Czarnecki, mushroom guru extraordinaire, who revealed the mysteries of mycological activity occuring deep beneath the ground in Oregon's forests. 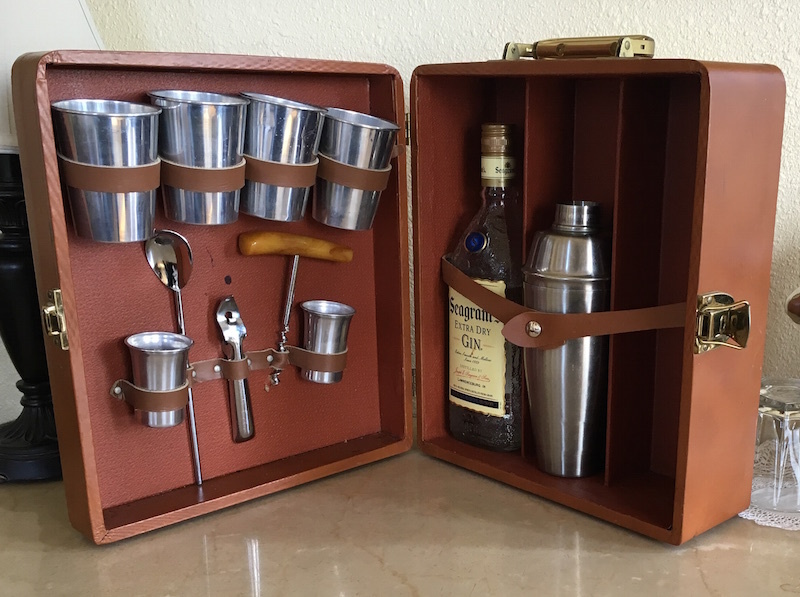 Then there's Linda Colwell, who, among many other things, shared her passion for infused liqueurs made from seasonal berries and luscious syrups made from flowers. Not only do I learn new skills and work with (and enjoy) the freshest ingredients, I get to know fantastically smart and interesting people, a win-win-win! One skill I've been jonesing to learn is pickling. (I know, right? It shocks me that I've never learned how.) No one in my family was into it when I was growing up, though I vaguely recall my mother tried pickling cucumbers a few times with apparently unsatisfactory results. 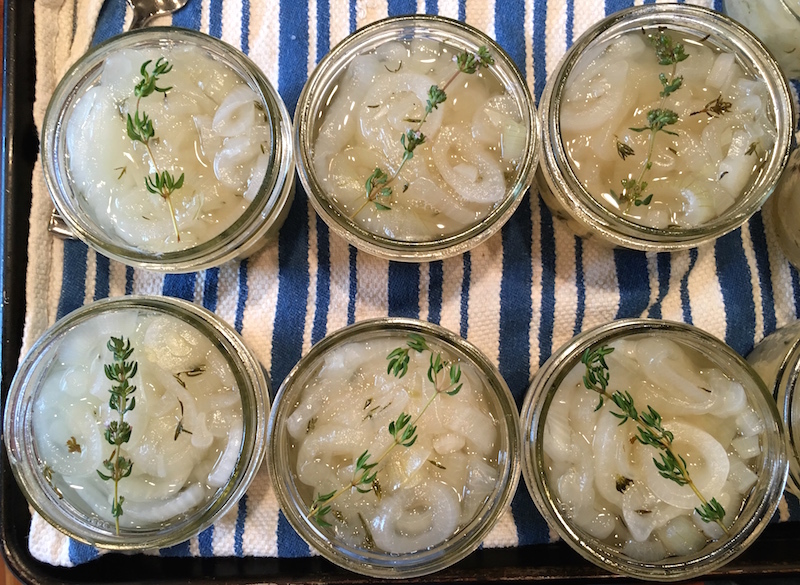 So I was thrilled when my neighbor Bill, an amazing gardener and super nice guy, called and said that he and his equally cool wife, Jen, were going to make a batch of pickled onions from the Walla Walla sweet onions he'd harvested from his garden. 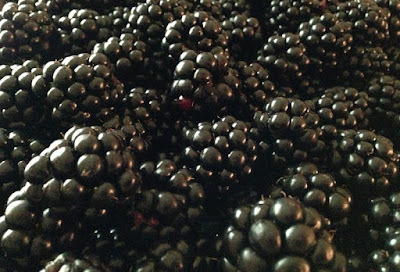 Trying to walk, not run down to their house, I arrived with a jar of black currant jam in hand as payola to find that Jen had sliced the onions into half-inch rings and salted them down, then rinsed them thoroughly. They'd also made a brine of vinegar, sugar and some thyme leaves from their garden. 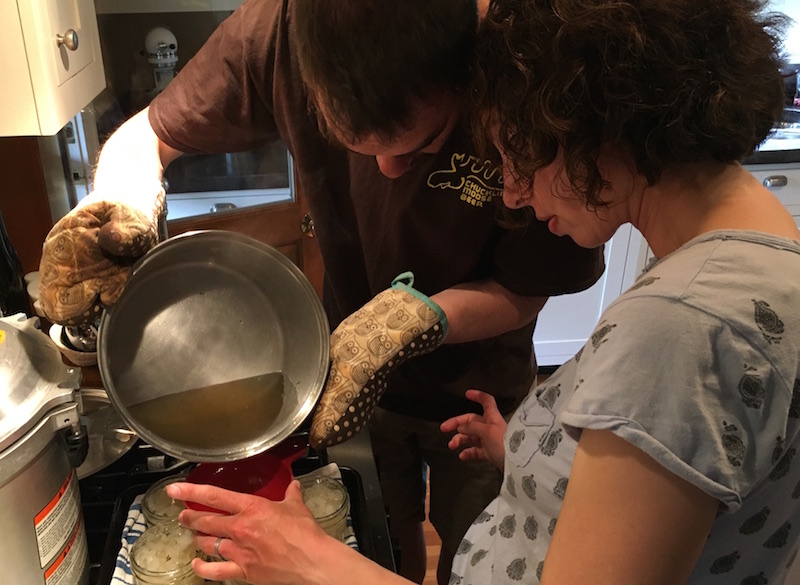 While the onions were cooking in the brine, Jen pulled washed jars out of the dishwasher and put canning lids into a saucepan to simmer and sterilize. 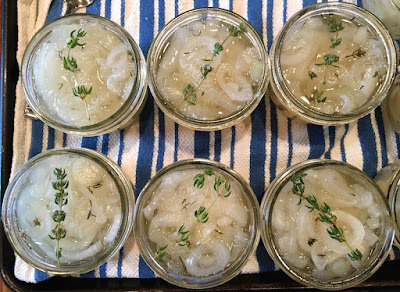 Then it was just using tongs to pluck out the onions and fill the jars, pouring the still-hot brine over the onions and putting the lids on before they went into a hot water bath for ten minutes. Seriously, the whole process took a little over 90 minutes start to finish—along with the serious amount of time I spent wondering what in heck had prevented me from trying this simple process before. Thanks, guys! Wash ten one-cup jars in the dishwasher (or wash by hand in hot water). Allow to dry. Fill canner 2/3 full of water and bring to boil. Reduce heat to simmer and cover. Place onions and pickling spice into large mixing bowl and combine. Set aside for 1 hour, occasionally mixing them with your hands and separating them into rings. Rinse thoroughly to wash off any remaining pickling spice and squeeze gently to remove as much moisture as possible. Set in colander to drain. While the onions are draining, put the vinegar, sugar and thyme leaves into a large pot and bring to a boil. Add the drained onions and when the brine returns to a boil, lower the heat slightly and cook the onions at a low boil for 10 minutes. While the onions are cooking, put the jars on a towel-lined tray. Put canning lids in a small saucepan and bring to a boil, then turn off heat. 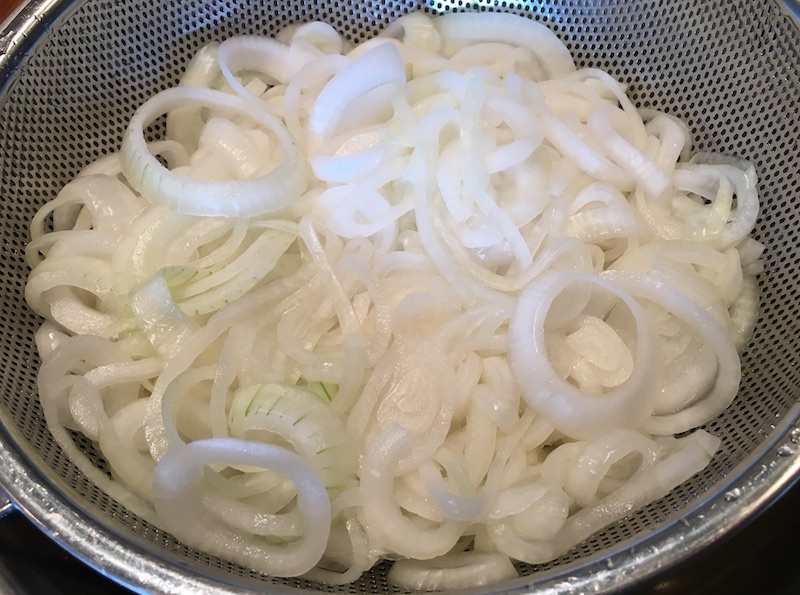 Using tongs, put onions in each jar to within 1/2" of the rim (you won't necessarily use all the jars). Pour hot brine over the onions in the jars to within 1/2" of the rim. Top with sprig of thyme, if desired. With a clean towel, wipe the rims dry and place the canning lids on top, then screw on the canning rings finger-tight. Using canning lifter, submerge jars in the canner and bring water to a boil. When water in the canner returns to a boil, cook for 10 minutes. Using lifter, remove jars from canner and set on a towel on the counter to cool. Listen for the lids to pop, signifying a complete seal. They can be stored in a cool, dark place for from several months or up to a year. In what is being trumpeted in the press as a major step forward for chicken producers, Perdue Foods, which bought Washington-based Draper Valley Farms in 2011 and is the fourth-largest poultry producer in the nation, said that it will be taking steps to overhaul its animal welfare practices. A recent article in the New York Times said that the chickens at one contract farm that is instituting some of the changes "bask in sunlight" and "flap their wings and chase one another." Chicken barn showing windows (at left end ). In truth, though, it's far from the picture that most of us have of chickens foraging in grass and pecking at bugs. 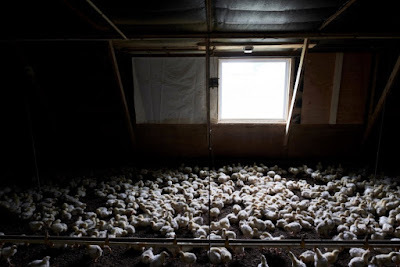 The chickens at these producers will still live in huge flocks of thousands of birds crammed into long, low barns and live on floors covered with litter that is a combination of their urine and feces, causing their skin and feet to blister and burn. 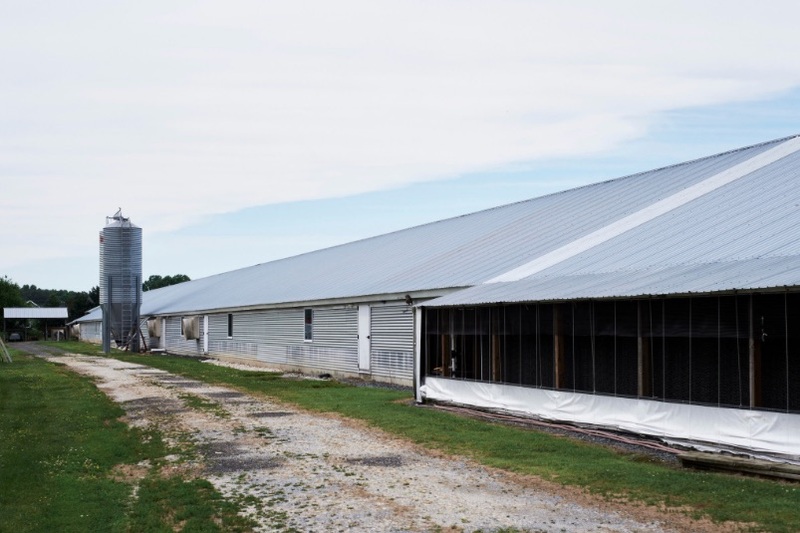 The windows being installed in the barns (top photo) are small and high off the ground, and spaced perhaps thirty feet apart, not exactly allowing the birds to "bask" in the meager light they provide. Perdue has also been taking steps to eliminate antibiotics from diets of the 676 million birds it produces, estimating "it has eliminated antibiotic use in two-thirds of the chickens it processes, up from 50% a year ago" and that "half of the company’s turkeys and about half the poultry it sells to restaurants are raised with no antibiotics," according to Perdue officals quoted in an article in the Wall Street Journal. What caused this sudden change of heart? "Consumers have voted," the Journal quotes Eric Christianson, head of marketing for Perdue, as saying. "We’re embracing it, because it’s what the consumer wants." While it's a far cry from the measures that concerned consumers would like to see when it comes to the welfare of the animals that they'll be feeding their families—as well as issues like pollution from waste runoff, worker safety and wages, affects on neighbors, etc.—it does show that even large corporations respond when pressure from consumers is put on their bottom lines. Photos from the New York Times. 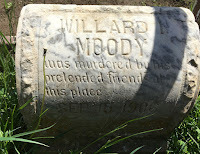 This morning I was thrilled to check my e-mail and find a message from Anthony Boutard with news of the latest goings-on at Ayers Creek Farm. As mentioned below, pencil in July 30-31 on your calendar and make plans to head out to the farm to purchase the goods direct from the farmers themselves. Yesterday our local funeral home offered us, for "Absolutely Free!," a copy of their Final Wishes Organizer®. There was also an offer of a prepaid funeral plan, though, for our tastes, R.I.P. stands for Rot In Place, or just leave us out for the vultures, bot flies and carrion beetles. A return to nature. But it got us to thinking that we have been so wrapped up in the business of farming, we had failed to provide any updates. 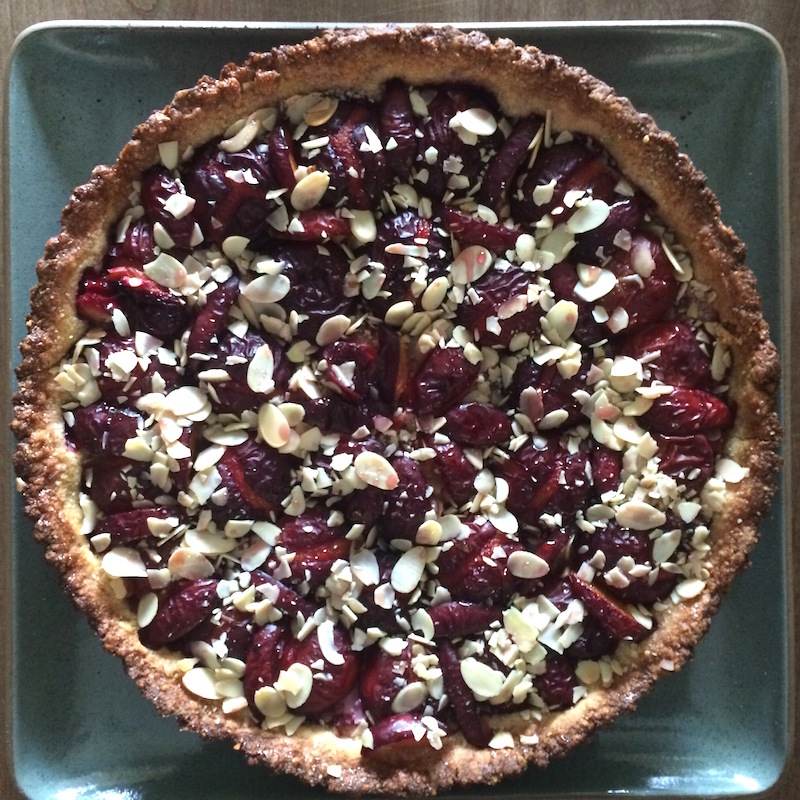 Linda Colwell's Amish Butter cornmeal crostata with Imperial Epineuse plums. We are always amused by the abject distain Chesters receive in the press. For example, in 2007 the New York Times described them as "mediocre." 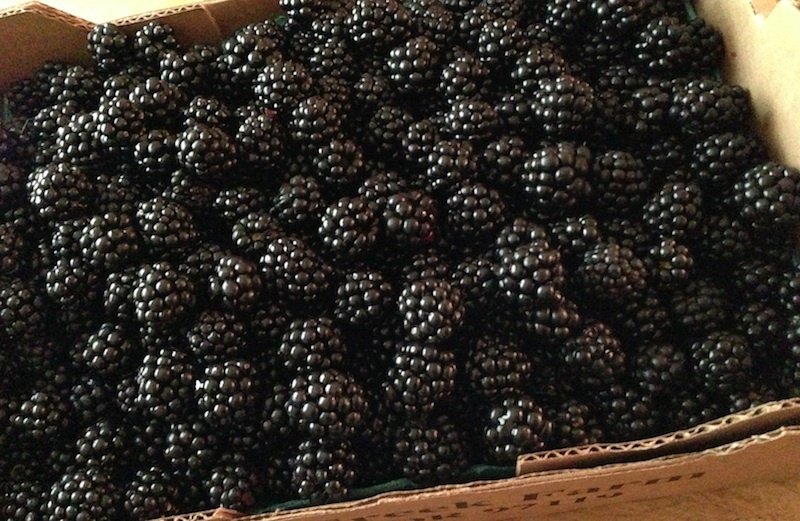 A couple of years ago, the state's incredible shrinking tabloid of record, otherwise known as The Oregonian, described them as in "the marionberry family, chesters come with small seeds and a bitter taste." Last week, their Food Day article extolling the season's berries completely ignored the Chester, which we guess must be judged as progress. No big deal, weather permitting, we expect to sell between 60,000 and 80,000 hallocks generously filled with Chesters over the next five weeks without the help of the Oregon's tabloid press. Still, it leaves us scratching our heads. 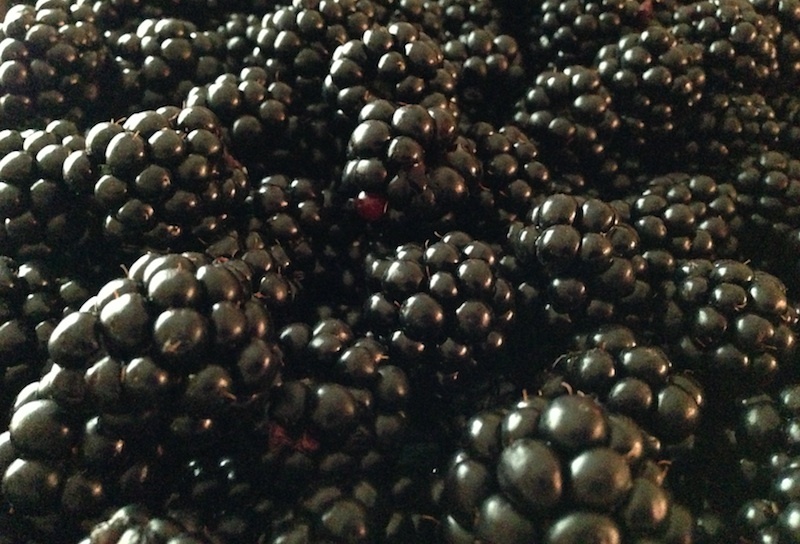 For some crazy reason, in 2001 this berry, so reviled in the press, earned "Outstanding Fruit Cultivar Award" by the American Society for Horticultural Science; maybe because it really is so delicious. That's our theory backed by some empirical evidence. Parched green wheat (i.e. 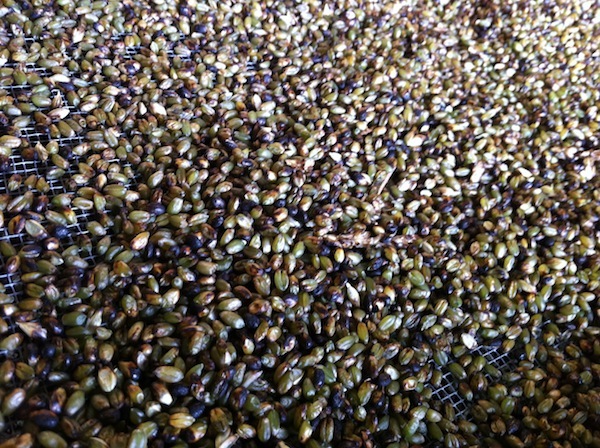 the grain formerly known as frikeh). 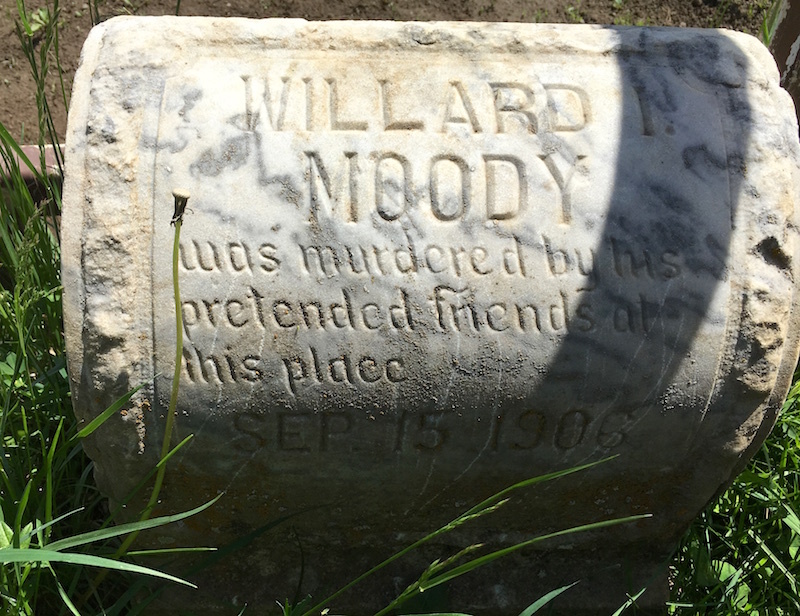 We are planning to resume our open farm days the last weekend of July [tentatively 7/30-31], as soon as we wrap up the many loose ends dangling about the place. 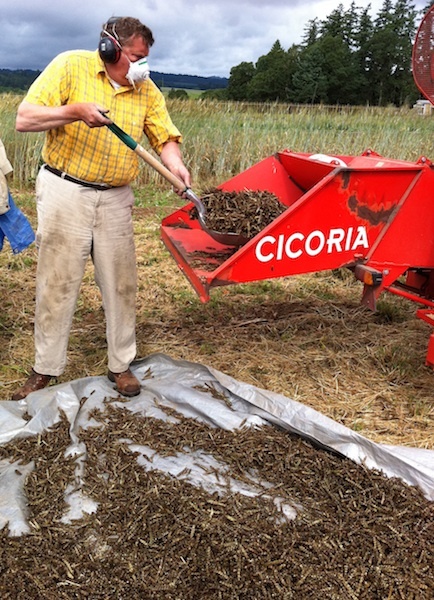 We need to finish threshing out the favas and barley, and get the chicories planted. We are finishing up the cleaning of the parched green wheat as well. As soon as we have the details nailed down, we will send another update. We know there is some impatience out there, but if we get everything done well here, there will be an abundance available for everyone once we are ready to resume the farm days. We don't have any social media presence, at least that we know of, nor even a website, but a search for the #ayerscreekfarm hashtag at Instagram offers visual proof that we have been busy in the past two months. And having an Italian-German colleague, Myrtha Zierock, our Resident Fellow, has left us well fed and happy as well. 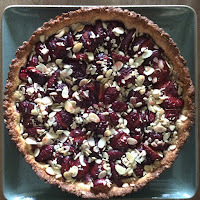 Photo of plum crostata by Linda Colwell.